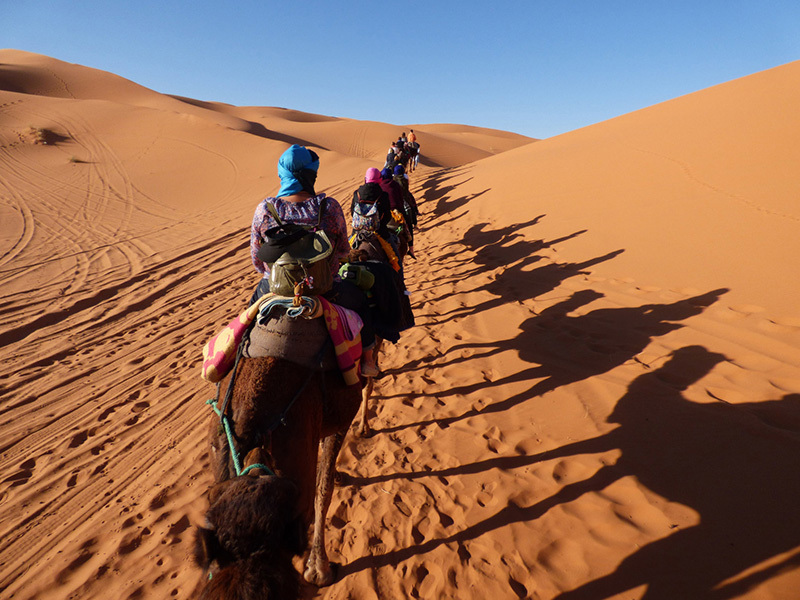 Morocco Camel Ride – a great tour with boundless unforgettable experiences! A trip to Morocco can be an amazing and memorable experience for you. 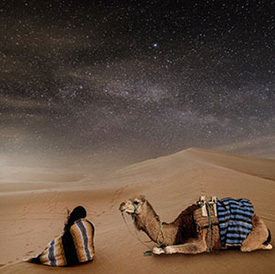 Certainly, It can be a dream for every traveler to visit the Sahara desert riding on top of a camel. So, Morocco is famous for camel riding activities in the Sahara desert and around the area as well. The brown shiny sand attracts travelers in the day tour, and at night provides a completely awesome view of millions of bright stars on the clear sky. 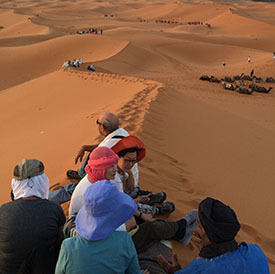 The tours offer a chance to explore the landscape while sitting on the back of a camel. A small town in southeastern Morocco, Merzouga is a very close place to the Algerian border. First of all, It is situated on the edge of the desert. So, you can see the splendid hills of the Merzouga desert on an overnight stay at a Berber tent in Erg Chebbi. If it’s your first time in a desert night then try to sleep at night under a canopy of stars. You will wake up to a mesmerizing morning sunrise. 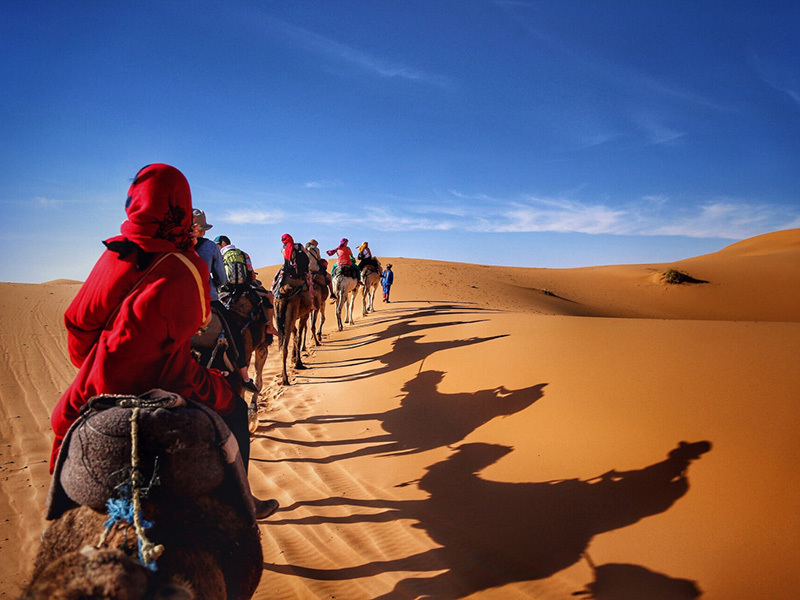 To increase the enjoyment twice, listen to traditional folk songs when crossing the sand desert with a camel. There are available restaurants, souvenir shops, hotels, and many facilities for travelers. Travelers enjoy a remarkable scenic camel ride Marrakech tour surrounded by eye-catching palm trees and many other vegetation fields. If you would like to meet new people then visit a local Berber family home talk to them to get experience about their lifestyle. Don’t miss to enjoy a refreshing Moroccan mint tea and also tasty traditional snack. Ready your camera to take spectacular sunset images on camelback. 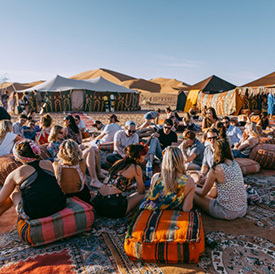 You can earn exclusive experiences by spending a night in a desert camp or have the option to sleep under the stars. 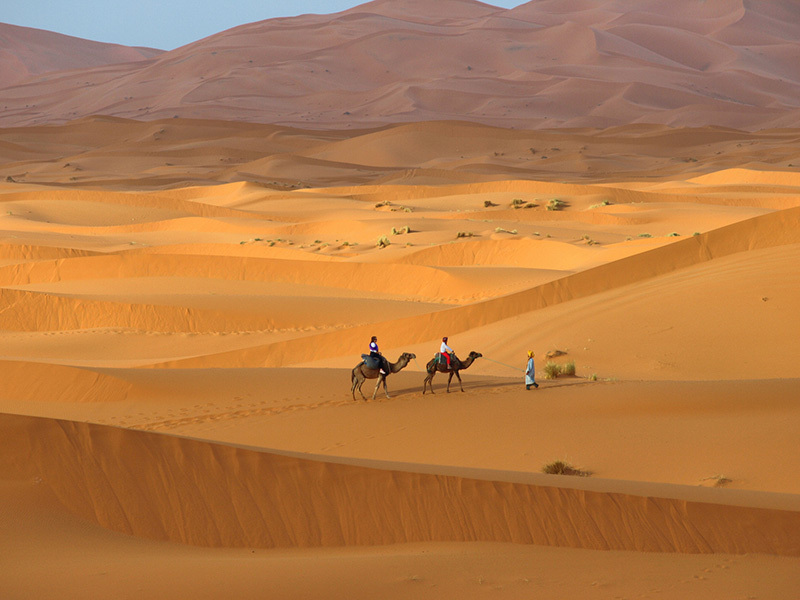 Near Merzouga, the dunes of Erg Chebbi are 30 miles southeast of Erfoud. It has the highest amazing sand dunes in Morocco city. You can explore the outstanding desert landscape. If you are physically fit. Then, climb the dunes for capturing sunrise and sunset moment to watch the light and color of the sand change. 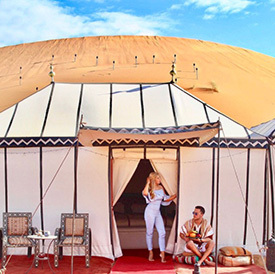 Luxury or deluxe desert camps can be described as 5-star living in the middle of the desert. Think luxury at the highest level – a 5-star hotel room within a very spacious tent with private en-suite bathroom, wall-to-wall rugs, a comfortable bed, armchairs, and quality linen. Electricity is provided in the tent via solar power. The tents surround a cozy, relaxation area where you can enjoy a scrumptious dinner of Moroccan specialties under a blanket of stars, and as entertainment, the beating of drums and singing to the tune of traditional Berber music. In the next morning, breakfast is served before you return to the hotel on your camels to continue your journey to the next destination..
Camels are means of transportation for thousands of years and you may not have met camel before but your ride would have seen hundreds of humans which makes them social and you should not be surprised when they go to blow in your face which is their form of greeting one another. Camels are languid souls and they are fairly safe to ride if you can follow the sitting and holding position as you are told to do so by your guide. They can act unpredictable sometimes under unusual circumstances and you should try to follow the rules of the ride to be safe. If you have enough time then visit the High Atlas Mountains in Marrakech. 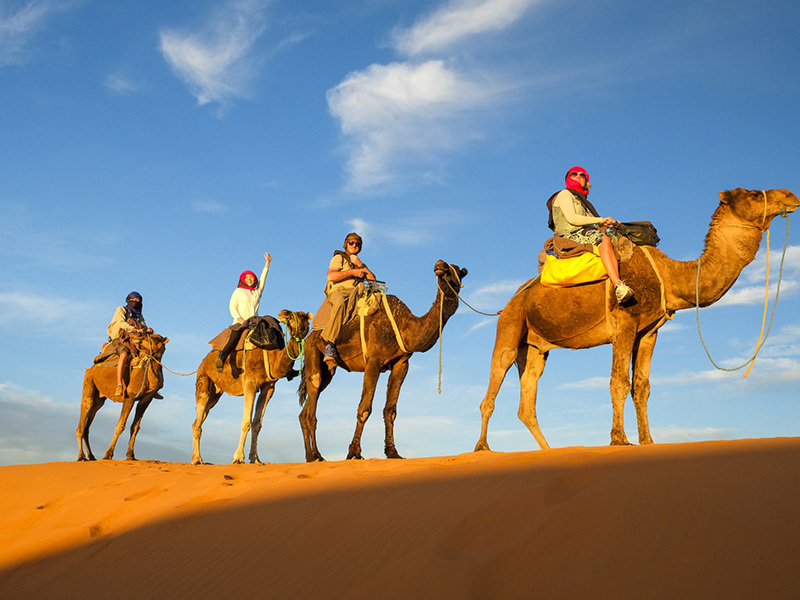 A Morocco camel ride trip provides excitement to a couple’s romantic getaways and a group of friends. It’s possible to complete this activity within 2 hours. 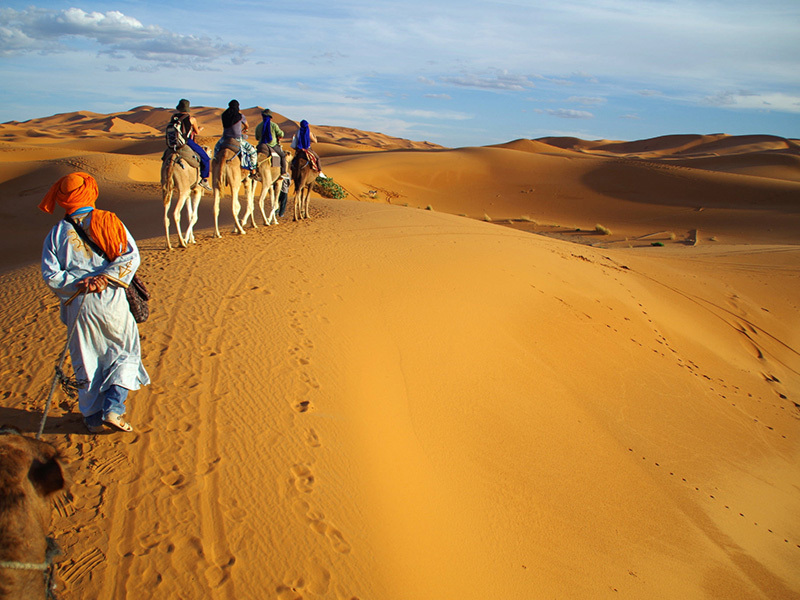 However, if you want to visit Merzouga and Fes then choose several days for more to enjoy. Camel trekking is always an exciting activity for a traveler however, you can enjoy it perfectly during the September to February months. Don’t miss, Morocco will be your next holiday destination!